This essay by Gananath obeyesekere that appeared in Sri Lanka in Change and Crisis(Ed.James Manor, 1984) is a close investigation into post 1977 political realities, the implications of which have much to do with present impasse that Sri Lankan society seems to be in. Gananath obeyesekere, the greatest anthropologist produced by Sri Lanka was born at Meegama in Darga Town in Kalutara. His father D.D.Obeyesekere, as he once remarked a cosmopolitan figure at that time in his life, was a lecturer in the Institute of Indigenous Medicine in Sri lanka. And he was also an adherent of Anagarika Dharmapala. Gananath obeyesekere received his B.A. in English with a first class honours in 1955 at the University of Ceylon in Peradeniya. He recalled later about his higher education as to how he came to refuse the suggestion offered by his professor to join the English department, at that time the prestigious department in the university and also automatic scholarships to London and Oxford because of his sneaking anti-colonialism despite the fact that left-wing leaders of Sri Lanka went to London or Oxford, or Cambridge. He obtained his M.A and PhD in University of Washington. 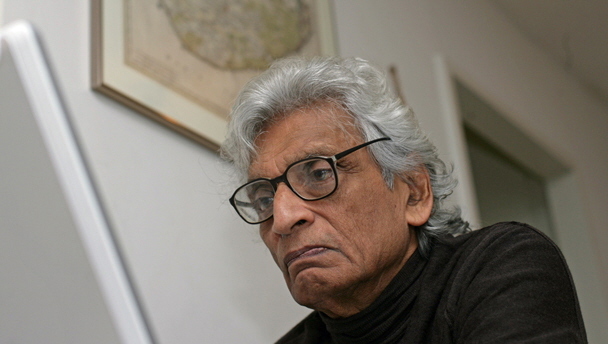 Gananath Obeyesekere is Emeritus Professor of Anthropology at Princeton University. Before his appointment to Princeton, Obeyesekere held teaching positions at the University of Ceylon, the University of Washington, the University of California, San Diego. His books include Land Tenure in Village Ceylon, Medusa’s Hair, The Cult of the Goddess Pattini, Buddhism Transformed (coauthor), the Work of Culture, The Apotheosis of Captain Cook: European Myth-making in the Pacific, Imagining Karma, Cannibal Talk, Karma and Rebirth and The Awakened Ones. He was also engaged in collecting and publishing rare historical manuscripts in Sri Lanka, which challenge the orthodoxies dominant in history. Among his numerous academic awards is the Thomas Huxley medal, which is given by the Royal Anthropological Institute and is listed as “the highest honor at the disposal of the Institute”. Obeyesekere has been a Guggenheim Fellow and a Suntory-Toyota Fellow (STICERD) at the London School of Economics. His book on Captain Cook won the Louis Gottschalk Prize in 1993, awarded by the American Society for Eighteenth Century Studies. In Colombo on 26 July Air Lanka, the country’s only airline, put out its usual television advertisement, ‘Visit Sri Lanka: A Taste of Paradise’. This commercial, with pictures of brand new hotels with expanses of beach and ocean and tables overflowing with lobsters and tropical fruits, routinely appears, but on this occasion the advertisement was not in the best taste. The paradise isle was in flames, the houses and business establishments of the minority Tamil community were being systematically burnt and looted by well-organized mobs belonging largely to the lumpen proletariats of the cities and small towns of Sri Lanka. The brutality was unbelievable: homes and shops were set alight, cars were doused with petrol and lit, sometimes with the occupants inside; some people were hacked to death, others burnt alive. Thirty-five political prisoners were killed by irate regulars in the country’s maximum security prison. The next day, 17 more were slaughtered in the same manner. There was a total breakdown of law and order in the nation that had been touted by foreign governments as the model of stability, the apogee of free enterprise. A few days and the illusion was shattered: the house of cards had crumbled. The antagonism between Tamils and Sinhalese is rooted in the country’s history but has been exacerbated into inter-ethnic violence only since 1956. Sporadic riots, characterized by extreme brutality, occurred periodically thereafter, but what was striking about the events of 1983 was their scale, which was beyond anything that had ever occurred before, and the fact that the marauders were not uncontrolled mobs on the rampage (this occurred later) but, at least on the first day (25 July), well-organized groups who had electoral lists of Tamil houses and enterprises and systematically went about destroying them. The purpose of this paper is to examine the historical and cultural origins of this violence and its institutionalization since 1977, and particularly during 1983. 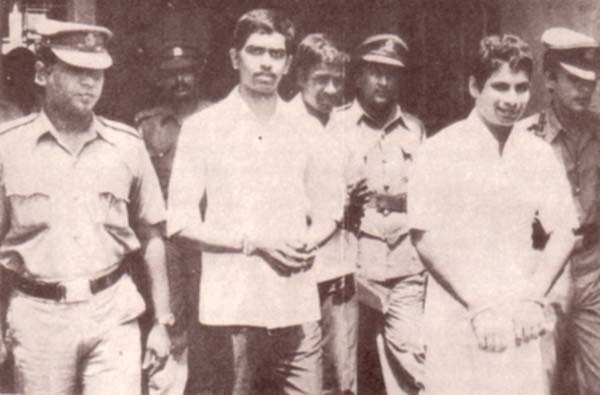 Before, 1983, violence had been practiced by both sides, but its systematic organization was characteristic only of the Tamil extremist (terrorists) of the north, and they for the most part targeted their attacks on police and military personnel and occasionally on Tamil politicians who supported the government of President J.R. Jayewardene. When violent acts were committed, the brutality on both sides was extreme. Tamil terrorists who killed service personnel were not content with killing per se , but they also disfigured the bodies and desecrated the corpses. This time, however, the Sinhalese outdid all others in the scale and brutality of their violence. Their attacks, like those of the Tamil terrorists, had planned, systematic character. The political organization of violence goes beyond the problems of Tamil – Sinhalese ethnic conflicts and has larger political implications for the future of democracy in the island. What, then, is the background to this violence, unprecedented in the recent history of a country designated by the people themselves as dhamma dipa, ‘the land of the Buddha’s dharma’, a doctrine of non-violence and compassion? I am a Sinhalese and a Buddhist and this is the troubling question that I ask myself. Even to attempt an answer one must focus on the historical and cultural background to the conflict and, most crucially, on the recent erosion of the law and the institutions of justice and with it the political institutionalization of violence in Sri Lanka. Underlying the linguistic and religious differences which have been explained in the introduction to this book are strong cultural and racial similarities. Physically the Sinhalese and Tamils cannot be differentiated. Though the initial Sinhalese migrants were probably Indo – European language speakers who arrived over 2,500 years ago, practically all later arrivals were South Indians (mostly Tamil speakers) who were assimilated into the Sinhalese – Buddhist community. The South Indian influence is omnipresent among Buddhists. On a level of popular religiosity Buddhists propitiate Hindu gods like Vishnu, and Skanda, the son of Shiva. However, the Buddhists view these gods as totally subservient to the Buddha while the Tamils view the Buddha as an avatar of Vishnu. Kinship and marriage patterns among the Sinhalese are also part of a larger Dravidian pattern. It is these cultural and sub doctrinal similarities that permitted the assimilation of South Indians over centuries into the Sinhalese Buddhist social structure. The core of the Sinhalese identity was Buddhist: the destiny of the ethnic group and that of the religion were inseparable. Myths and historical events confirmed the twin facets of this identity. Historically, almost all the invasions of Sri Lanka came from South Indian kingdoms. Thus opposing the Sinhalese – Buddhist identity was the Tamil – Hindu identity. In times of stress, these identities were reaffirmed to mobilize popular support. When the Portuguese arrived in Sri Lanka in 1505 there were several contending kingdoms in the country among which was a Tamil Hindu kingdom in Jaffna, the northern peninsula of the island. No king was content to see himself as ruler of the part of the island since the island was always considered a single entity. The call for a separate state of Tamil-speaking peoples is thus a contemporary historical phenomenon. In so far as it is the current reality, we must enquire how it came about. The Tamil kingdom of Jaffna had ceased to be an independent unit in the sixteenth century when it was captured by the Portuguese and then by the Dutch. The Sinhalese Buddhist kingdom in the interior of the island remained independent till 1815 when it was taken by the British. The Tamils of the east coast and parts of the North Central Province traditionally owed suzerainty to the Sinhalese kings of Kandy and trade routes connected the east coast with the kingdom of Kandy. Sinhalese – Tamil intermarriage, exceptional in the north, was accepted and practiced on the east coast until recent times. When the British took over Sri Lanka, they introduced yet another complexity. The brought in large numbers of South plantations of the central highlands. Thus there were three Tamil – Hindu zones well established by the end of the nineteenth century: in the north, in the east and in the central highlands. Though outsiders (as well as some Sinhalese) see the Tamil problem as one, the internal reality is very different. The northern Tamils were much more orthodox Hindus than Tamils elsewhere and were strongly patrilineal. The east coast Tamils came from Kerala and were divided into matrilineal clans, while the Tamils of the central provinces were recently introduced groups from South India, alienated from both the other groups. They were thrust into the midst of a surrounding Sinhalese population from whom they were also alienated. During the early twentieth century when constitutional agitation against British rule gathered momentum, Sinhalese and Tamils at first presented a united position. In 1919 the Ceylon National Congress was founded by both Tamils and Sinhalese. But political parties soon began to polarize along communal lines. The Sinhalese increasingly felt threatened by Tamil control of business and the professions while the Tamils became increasingly self-conscious of their minority identity. The political democratization of the state exacerbated these tendencies. Universal adult suffrage was introduced in the 1931 elections and this brought communal issues into public voting patterns. When Independence was declared in 1948, there were several Tamil political parties with an exclusively ethnic base, while the ruling United National Party (UNP), the main Sinhalese party, though formally non-ethnic, was in reality committed to Sinhalese nationalism. A further escalation of Sinhalese – Tamil tension occurred after 1956 which saw the massive electoral success of Mr. Bandaranaike’s Sri Lanka Freedom Party (SLFP) over the UNP. Much of Mr. Bandaranaike’s success depended on the slogan ‘Sinhala Only’” there was to be one language for the nation – the language of the majority – Sinhala. This led to Tamil demands for equality of status for both languages and for grater autonomy for Tamil areas which generated Sinhalese anxieties about a Tamil separatist movement with South Indian support which might threaten the very integrity of the state. In the 1970s, economic hardship, unemployment and the rise of discontented youth groups created new problems. 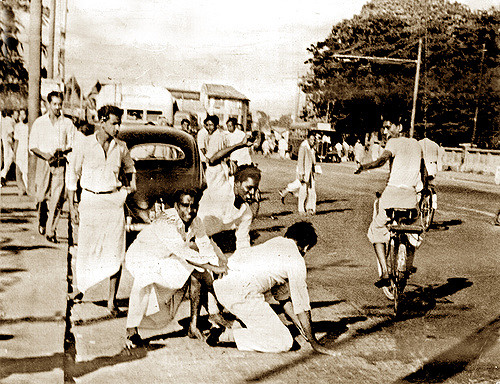 The abortive insurrection of 1971, based on Sinhalese youth, was one example. In the Tamil north, similar bands of young militants demanded a separate Tamil state. 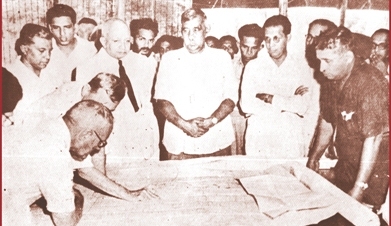 As a result of their pressure, the Tamil Federal Party changed its name and manifesto, becoming the Tamil United Liberation Front (TULF), committed to an independent Tamil state. This fanned Sinhalese fears which increased further which Tamil youths in the late 1970s, funded by expatriates, adopted terrorism to achieve their goal. Terrorism in turn forced the government to send an ill-disciplined and poorly trained army into the Tamil areas of the north, further exacerbating the pattern of violence and reprisals. It is against the backdrop of this complicated situation that one must understand the importance of the religious revivals of the late nineteenth century and their impact on Tamil and Sinhalese identities. Briefly stated, the trauma of imperial conquest and the disestablishment of the two major religions produced in the north a Tamil – Hindu revival movement headed by Armugam Navalar and in the south a Sinhalese – Buddhist revival headed by Anagarika Dharmapala. Both reformers were educated in Protestant Mission Schools and brought a kind of ‘this-worldly ascetism’ (very like the Protestant ethic) into Hinduism and Buddhism. Both rationalized their respective religious, scorned folk beliefs and rituals, affirmed their respective great traditions. Navalar have contemporary Hinduism a philosophical base in Saiva Siddantha while Dharmapala affirmed the ascetic and abstract values of doctrinal Buddhism largely influenced by Western commentators on Buddhism. Both provided a philosophy and an ethic for classes that had practically no historical parallel in the past – a bourgeoisie and a proletariat that emerged in the colonial and post-colonial periods. Dharmapala not only affirmed the traditional Sinhalese – Buddhist identity but opposed it to other identities – Muslim, Hindu, Christian. 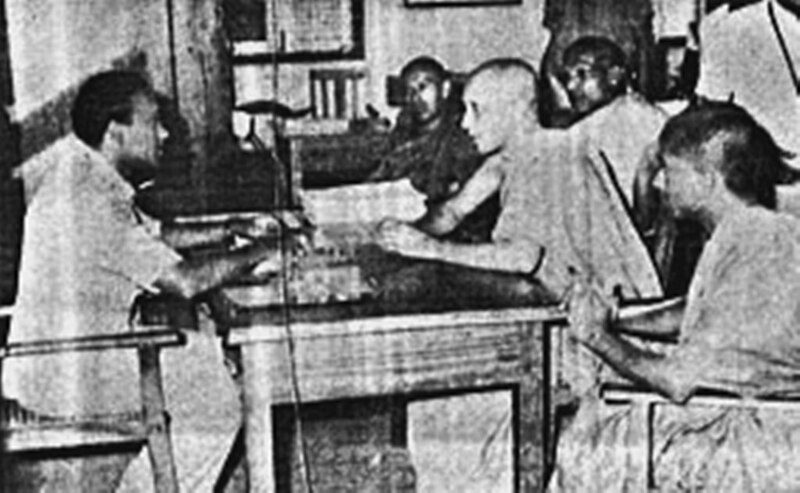 The victory of Mr. Bandaranaike in 1956 was spearheaded by those who were directly or indirectly influenced by Dharmapala. Thus the post-1956 era saw the introduction of a new fundamentalist and militant Buddhism advocating the takeover of denominational schools to reduce the power of the Christian missions; the compulsory teaching of religion in schools; the propagation of the intellectualist view of Buddhism as being not a religion but a philosophy consonant with the spirit of science; and above all the use of Buddhism for political purposes. As a result, in our time, Buddhism had effectively become the political and civil religion of the state, the implications of which are further explained in R.L. Stirrat’s paper in this volume. In popular as well as doctrinal Buddhism, the Buddha was not a conventional deity that could either grant favours or affect the movement of history. He had achieved nirvana, the state of final bliss and consequently had no interecessionary role in the affairs of the world. The internalization of this figure in the socialization of children was radically different from that which occurs in monotheistic religions or in Hinduism where the deity is an active figure issuing punishments and rewards for the transgression of religious morals. People worshipped the Buddha as the embodiment of Buddhist values, but demanded nothing from him and expected nothing. Abstract Buddhist values such as karuna (universal kindness), metta (compassion), mudita (tenderness), etc. and the complex Buddhist philosophy (such as the theory of dependent origination) were never inculcated as abstractions. Abstract Buddhist ideas were concretized through the Buddha legend and the Jataka tales in which the Buddha’s exemplary life, his self-sacrifice, his compassion for others, etc., were described. The values embodied in these tales were disseminated in various ways: through sermons, religious gatherings at temples and through popular books. Villages also staged many ritual dramas where these themes were enacted or sung. The opposed values of greed and hatred were embodied in demonic figures of evil which also formed a part of folk beliefs and rituals. Thus what I have called Buddhist identity – the idea that Sinhalese equals Buddhist and that the nation is a Buddhist one – was tempered by a Buddhist conscience which concretized the abstract values of the doctrinal tradition and gave a Buddhist humanism to traditional culture. With the reforms of the nineteenth century, Buddhist folk traditions were rejected by the Sinhalse bourgeoisie. The Jataka tales were underplayed or rationalized. The emphasis shifted to the abstractions of the textual traditions highlighted by Western scholars. Buddhism was a compulsory school subject and parents lift the onus of teaching Buddhist values to the school curriculum. The socialization of the conscience, to be effective, must start in infancy and early childhood. Today, this is rarely done. As for the ritual dramas they are non-existent in urban society and are dying out even in the villages. An absence or gap thus exists in the Buddhist conscience. People attempt to fill this gap in a variety of ways, through the inculcation of bourgeois moral values imparted through a secular idiom or through meditation. But what happens with a lumpen proletariat in a city like that of Colombo, where half of the people live in crowded slums and only a quarter of its children go to school? The gap must surely be wide. To continue the metaphor, the empty space in the Buddhist conscience is then filled with the predominant identity, Sinhalese equals Buddhist, reinforced by the hatreds and frustrations that slum dwelling breeds everywhere. One of the fascinating problems of population growth in Sri Lanka is the relative absence of huge cities on the scale of other Asian nations (excluding Burma). People seemed to prefer to migrate into villages, and up to the 1940s this was the dominant pattern. Through time, however, this had the unfortunate effect of destroying the homogeneous kin-based nature of village society, and producing a variety of social groups in village life competing for scarce resources. The spillover from increasingly large and heterogeneous villages moved into the little market towns scattered all over Sri Lanka, and of course into Colombo, the nation’s one large city. The trade in these market towns is controlled by Sinhalese, Tamil and Muslim merchants. Racial violence was often sparked by business competition. Merchants employ the dispossessed proletarians of these town to eliminate business rivals, especially during periods of post-election political violence. In addition to these anomic market towns, colonization schemes where surplus villagers were siphoned off to new irrigation projects generally in the north central and southern dry zones became increasingly important after Independence. The recruitment to the colonization schemes took place from crowded village areas. Settlers were often chosen by local MPs, from among party supporters. As a result settlements but not communities were created. Often, in more recent projects, total outsiders have come in and taken over political control of colonies. In addition, outsiders from Colombo and its suburbs have begun to infiltrate old villages as small-time merchants and entrepreneurs. Practically all civil disturbances – post-election riots (endemic after the 1960s) and race riots – have occurred primarily in these lumpen colonization schemes, in the anomic market towns and in Colombo. These civil disturbances have never been a village problem – though it will soon become one as the villages change their character. One of the features of the politics of Sri Lanka since the 1960s is the use made by politicians of all parties of these dissatisfied urban people. Nowadays it is routine to use them to intimidate opponents or voters. Since the 1960s it has been commonplace for ordinary citizens to use phrases like ‘so-and-so’s (politician’s) tugs’. Furthermore, increasingly disturbing trends have occurred in the use of these elements for political ‘thuggery’ (as it is called in Sri Lanka). These trends are not my inventions – they have been widely reported in the local press. Here are three examples. First, thugs who are at the service of politicians in power are linked on the local level to merchants, some of them genuine businessmen but other involved in a variety of illegal activities, the most common of which are kassippu (moonshine) distillation, ganja (cannabis) cultivation and distribution, and the felling of timber from forest reserves. In recent visits to villages in Sri Lanka I have come across MPs serving remote areas actively involved in these activities, especially the latter two. Second, police who oppose these activities or prosecute these people can be, and often are, transferred out of the area or cowed into acquiescence in illegal activity. Several newspaper editorials over the last few years have underscored this trend. The result has been the demoralization and corruption of the police force. Village people whom I interviewed in many parts of the nation often mentioned that the police are in the hands of the local MP or local undesirable. The view is widespread that some of the institutions of justice have become an alienating force turned against the people themselves. The third and most disturbing trend in the institutionalization of violence occurred after the massive election victory of the ruling UNP in 1977, in its relations with the trade union known as the Jatika Sevaka Sangamaya (National Workers Organization), hereafter referred to as the JSS. Prior to the 1977 election , the JSS was a minuscule working-class trade union (most unions being controlled by the Marxist parties of Sri Lanka). Today the JSS is the single largest union in the country and has an effective say in the working of government offices and corporations. Its president is Cyril Matthew, the Minister of Industries, whose name has been explicitly mentioned by several foreign correspondents as an inveterate enemy of the Tamil minority. How did the JSS come into prominence? The answer is simple but one that has frightening implications. Traditionally the leftist unions provided a Trotskyite or Marxist ideology for the working classes. Whatever one may think of these ideologies, they had the effect of filling the empty space in the conscience of people with a specifically working-class ideology. After the massive election victory of the UNP, several political leaders emerged who had access to, and control over, the slums and anomic areas of the city. Prominent among them were R. Premadasa, the Prime Minister and Minister for Housing, whose power base was Central Colombo, one of the most crowded areas in the city; and M.H. Mohammed, Minister of Transport, who was MP for Borella (which also contains one of the largest slums in the city). With the expansion of the economy, produced by the free enterprise policy of the government, jobs in the working-class sector were increasingly given to members of this lumpen proletariat who swelled the ranks of the JSS. Soon members of other unions were intimidated into joining it. The JSS was without a working-class ideology; its leadership owed personal allegiances to party bosses. It is in a sense an exaggerated version of what I noted in the smaller market towns where culturally dispossessed people serve as small bands of thugs for local merchants and politicians. However, before 1977 these bands of thugs served their masters but had no institutionalized authority. The JSS changed this. They were now organized and they effectively controlled government offices and corporations and wielded enough power to transfer and intimidate even high officials. It also adopted and promoted the Sinhalese-Buddhist political ideology. The precarious identity of marginal people was thus given a new reality and meaning a political and nationalist ideology. The nature of this ideology was spelled out by their president, Cyril Matthew, in a speech in Parliament on 4 August, soon after the recent riots. Matthew’s thesis was that Sri Lanka should follow the Malaysian example as set out by Mahathir Bin Mohammed in his book, the Malay Dilemma. In this book Mahathir states, say Matthew, that while the Malays are for a free enterprise system, they should not allow other racial groups to compete with Malays. Protection must be initially afforded the Malay community and Islam (their religion) should be upheld and propagated. Malays have no place else to go, whereas the Chinese can go to China and the Indians to India. The Malays are the original or indigenous people of Malaya and the only people who can claim Malaya as their one and only country. In accordance with the practice all over the world (sic), this confers on the Malays certain inalienable rights over the forms and obligations of citizenship which can be imposed on citizens of non-indigenous origin. This thesis can be applied, say Matthew, even better to the Sri Lanka situation. Malaysia has 53 per cent Malays and 35 percent Chinese, Sri Lanka has 74 per cent Sinhalese and 17 per cent Tamils. In spite of this disproportion, Tamils dominate every aspect of professional and economic life. You do not have to go to madras, he says. Come to Colombo and you will see the Pettah (market district) dominated by South Indians. (This is no longer so, since the Pettah was burnt down in the summer violence.) The Sinhalese also have nowhere to go, but Tamils can go to India. The Sinhalese have been extraordinarily patient. In Malaysia, there was a political rally by Chinese in May 1969 when they jeered at Malay policemen. The Malay government squashed it, ‘killing all the Chinese who were there’. We, however, says Matthew, have been patient for ten years and now ‘what had happened there has occurred in Sri Lanka also’. Earlier in his speech Matthew quoted from another speech he made in Parliament: ‘By non-violent methods or violent ones the Sinhala people are ready’ to prevent the division of the country. Such an ideology has a great deal of appeal to the Sinhalese, but it is also fostered by the Tamil elites who self-consciously identify with the Tamils of South India. The Sinhalese identity nowadays is predicated on the view that since they speak an Indo-European language, they are of North Indian origin whereas the Dravidian-speaking Tamils are from the South. The historical reality, however, is totally different. Except perhaps for the oldest stratum of settlers prior to 500 BC, almost all subsequent settlers in Sri Lanka came from South India, mostly from Tamil Nadu, Orissa, and Kerala and quickly became Sinhalised. In fact, some of the most vociferously anti-Tamil castes among the Sinhalese were post-fifteenth century migrants from South India. By contrast, the Tamils of Jaffna and the East Coast have been in Sri Lanka from at least the tenth to the fourteenth centuries AD, if not earlier. They also came from divers parts of ‘South India though the Jaffna (Northern) Tamils now claim that they came from Tamil Nadu. The only group of recent Tamil immigrants are the estate populations of the hill country brought over by the British in the middle and late nineteenth century. Both sides share antagonistic myths that are opposed to historical reality, and, like human beings everywhere, they act in terms of the former – with tragic consequences. Matthew’s ideology is doubtlessly shared by a vast number of Sinhalese, but the JSS has given it an unprecedented militancy. Moreover, the union has spread its tentacles into other areas of the country. Thus today, MPs have created through the JSS and through other local groups in small market towns a complex, powerful network of organizations that can be put to political use. At the same time there has occurred a remarkable change in the composition of political power brokers in the country, even in village areas. Traditionally the vote, and especially the village vote, was delivered or controlled by an educated village elite, coming generally from ‘respectable’ families. This was true of all parties but especially the UNP, the country’s most important conservative party. Today this has changed or is fast changing; political power on the village level is in the hands of those who can control the unemployed and the discontented, primarily the youth. It is in this context that one must examine specific examples of political violence in recent times. A large number of these events have been documented by the Civil “Rights Movement (CRM) of Sri Lanka whose chairman until his recent death was a highly regarded Anglican bishop, the Rt. Rev. Lakshman Wickramasingha. Here are a few cased from the CRM files and my own notes. 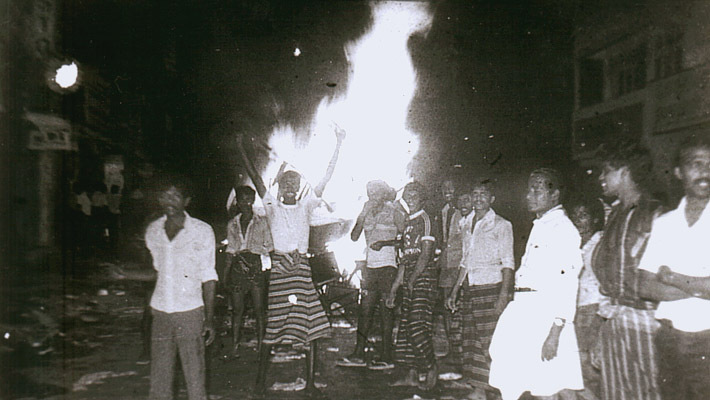 (1) A series of violent acts occurred in Jaffna in late May and early June 1981, of which the most serious was the burning of the Public Library by thugs from outside while the security forces did nothing to stop the arson. This was a profoundly symbolic act: the library contained priceless manuscripts pertaining to the identity of the Tamils of Jaffna. On the Buddhist side it was an unparalleled act of barbarism, since rarely in Sri Lanka’s recorded history (and perhaps even in the larger history of Buddhism) was there an example of book burning of this magnitude. The people of Jaffna identified the outsiders as the thugs of a prominent cabinet minister. The rumour in the Sinhalese areas was the same. Yet no action was taken by the President. Maduluwawe Sobhitha Thero was making a complaint to the police after the meeting was attacked. (2) A second even pertained to a gathering of artists and writers protesting against being refused work at the government-owned Broadcasting Corporation. A gang of thugs brandishing clubs and knives broke up this meeting, tore up the microphones, and chased away the participants. They shouted, ‘What kind of artists are your! We are Premadasa’s boys.’ It is of course unlikely that Prime Minister Premadasa had any had in this matter, but the thugs chose to make the claim. Even more disconcerting was a disruption of a meeting of a Sinhalese – Buddhist Middle-class organization where Ediriweera Sarachchandra, Sri Lanka’s best-known dramatist, was beaten up. Sarachchandra had written a satirical book called Dharmishta Samajaya (A Just Society) where he highlighted the dacay of cultural values brought about by the social and economic policies of the government. The thugs came in buses belonging to the state-owned bus corporation, and the Communist newspaper even carried the license numbers of the buses. Sarachchandra himself made a complaint to the police. As in previous cases, no police action was take. (3) On 15 June 1978, 9.30 a.m. about 400 thugs, members of the JSS, threatened six section heads at the Thulhiriya Taxtile Mills and drove them off the premises. The six were forced to resign. The management was warned by the thugs not to allow the six people back. It appeared that only JSS members and those who accepted their terms were allowed to stay in the Mills. (4) On 4 July 1980, teachers at Maharagama Teachers Training College were picketing peacefully when Government Transport Board bus No. 23 Sri 2549 came through the college gates, carrying 27 people including a leader of the JSS. Thugs got out and began to assault the teacher trainees with rubber belts, stones, bicycle chains, etc. Women were thrown to the ground and waste oil was poured over their clothes and into their eyes and ears. The toughs tried to run over one girl with the bus. Police arrived after the incident and took a statement. Two hours later people were taken to Colombo South Hospital. Four female teachers were seriously injured. (5) On 3 January 1980, the Personnel Manager of the People’s Bank was abused and assaulted in his office by JSS officers, in the presence of several members of staff. The police were informed and the four assailants were arrested. However, they were shortly released on minimal bail of Rs.250 each. The next day, a JSS official threatened certain staff members near the head office entrance over this matter. The management suspended four people from their jobs as a result of this incident. Then on 1 September, a mob roamed the building, abusing and threatening officers. Eventually, the police were sent for and the Staff Department was put under police guard. The mob then looted the canteen. On 1 November 1980 the interdicted JSS members were reinstated as a result of pressure exerted on the Personnel Manager to withdraw his complaint. He was later transferred. The pattern in these activities is clear: the gangs were organized, they came in government vehicles, they were sometimes accompanied by MPs and for the most part they belonged to the JSS, the trade union arm of the party in power. This almost certainly accounts for police inaction. These activities received little public comment in the press largely owing to the fact that the newspapers were either directly owned by the government or by supporters of the government. The exception was Aththa, the Sinhalese newspaper of the Communist Party, but its circulation was limited and its offices closed and sealed by the government for various periods of time. The greatest shock to public opinion, however, occurred as a result of two recent events whereby Supreme Court decisions seemed to have been openly flouted by the government. In a public meeting held in 1982 by an interreligious organization, a police officer seized leaflets that were being distributed. A Buddhist clergyman filed suit against the police officer. The court held that the police officer had violated the fundamental rights of the petitioner and decreed that damages and costs be directly paid by him. The Cabinet, however, promoted this police officer and ordered that the costs and damages be paid out of public funds. The government stated that ‘public officers should do their jobs without fear of consequences from adverse court decisions’. The second event followed a similar pattern but received full publicity in all newspapers and outraged the middle class, which had been generally favourable to a government that supported their class interests. In this case a senior left politician, Mrs. Vivienne Gunawardene, complained of assault and unlawful arrest by the police during a march to the American embassy in Colombo in protest against the nuclearisation of the military base at Diego Garcia. The Supreme Court presided over by three judges held that her arrest was unlawful and unconstitutional and ordered that the state pay her compensation. On the very day the judgment was issued, the Cabinet presided over by the President promoted one police officer involved in the case. A few days later practically all newspapers headlined the sensational news that thugs in government-owned buses paraded outside the homes of the three judges and shouted obscenities at them. The police were conveniently non available when the judges tried to contact them. I was then in Sri Lanka and it was commonplace for people gathered at bus stops and in other public places to speculate whether it was X Minister’s thugs or Y Minister’s thugs that did it. Prime Minister Premadasa, however, made a strong statement saying that the government took a very serous view of the matter and that ‘appropriate action will be taken in consultation with the Attorney-General’. Thus far nothing has emerged from police inquiries. It should be remembered, however, that this open scoffing at the judgment of the Supreme Court on these two occasions is part of a long conflict between the government and judiciary which commenced under the previous government of Mrs. Bandaranaike, particularly during the period 1970-77. The present government with its political slogan of a ‘Just Society’ promised to rectify these abuses, but in the last few years the rift between the executive and the judiciary seems again to have widened. Virtually every Tamil I met in mid-1983 was of the opinion that the violence against them was organized by the government , and especially by the JSS and the influential politicians who controlled this union. Given the pattern of political intimidation, this view has considerable plausibility, as the following example suggests. Sadly, the Government Medical Officers Association is not the only organization that has protested against the extension of political patronage to hoodlums. Sadly, there is nothing new in this malady…… it is to be seen in other state-controlled organizations where again the management apparently lacks the strength to enforce discipline on favoured section or individuals on their staff. One thing is clear enough. No state, no government, no party that condemns Nexalite (leftist insurgents that operate in Bengal) methods can condone equally outrageous behaviour in any institution under its control.